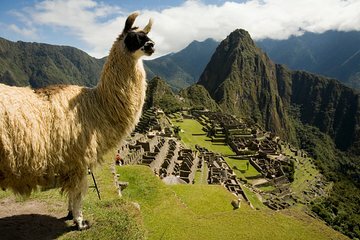 Non c'è modo migliore di provare Machu Picchu, una delle 7 nuova Meraviglie del Mondo e l'iconica cittadella Inca, piuttosto che un tour privato di 3,5 ore da Aguas Calientes. Ricevi un'attenzione indivisa da una guida personale mentre scopri la storia di antichi templi, colline terrazzate e siti sacrificali. Cattura le fotografie dai migliori punti di osservazione, entra faccia a faccia con i lama del posto e assorbi le viste spettacolari della Valle Sacra dal tuo punto vertiginoso. Sono inclusi i trasferimenti in autobus da Aguas Calientes. Fare questo tour privato significa che potrai scegliere un orario, tra le 5:30 e le 15:30, per salutare la guida e partire in autobus da Aguas Calientes. Dopo 20 minuti di viaggio fino alla collina di Machu Picchu, entrerai nel sito archeologico e inizierai un tour di 2,5 ore dell'antica cittadella Inca, caratterizzata da colline terrazzate, lama locali e montagne che spiccano in modo drammatico. Arricchisci le tue conoscenze storiche in luoghi di interesse archeologico, tra cui il Tempio principale, la tomba reale e la Piazza Sacra, e cattura spettacolari fotografie in punti panoramici sulla strada per la Porta del Sole e il Tempio del Sole. Una guida privata ti consente di fare numerose domande e personalizzare il tuo itinerario in base ai tuoi interessi. Inoltre, la tua guida è più che felice di scattare fotografie di te e della tua festa per tutta l'esperienza. Dopo un'approfondita esplorazione del più famoso sito archeologico del Sud America, tornerai ad Aguas Calientes in autobus. Our met us the evening before with our tickets and information about the tour. We met at the agreed time the following day and she provided us with additional information that we would not have received if we toured on our own. Our tour guide, Nelida, was amazing! She met with us at our hotel in Aguas Calientes the night before our tour to go over everything and came to our hotel the next morning to begin the day. She was very knowledgable and when faced with a crowd she would take us aside and show us something off of the main path. She was very polite and offered to take pictures for us, as well. 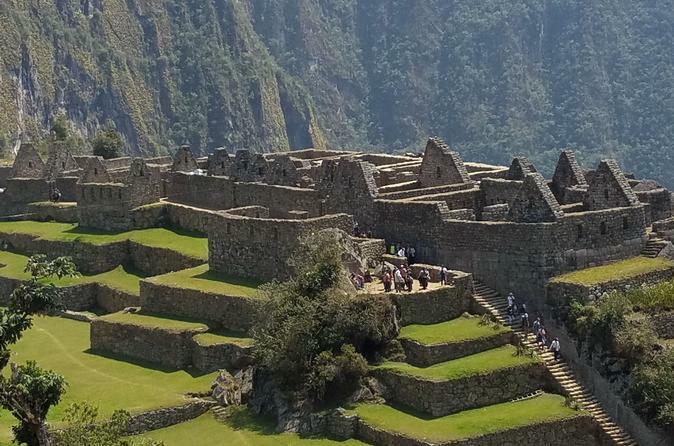 My husband and I highly recommend this tour and felt it was essential to our experience at Machu Picchu. This was perfect for us. The tour guide Louis met us at our hotel the night before our tour and gave us our bus tickets and our tickets into Macchu Picchu. We arranged when to meet the next day. She escorted us on the bus and gave us a great deal of information through out our tour. The best thing was she was very accommodating and patient with us since my husband's bad knee makes it hard for him to walk very fast. If you've ever dreamed of going to Machu Picchu and have been putting it off, do it! I am still high from the experience and feel privileged to have gone. After an almost 4-hour train ride from Poroy (outside of Cuzco), we arrived in Aguas Calientes and our tour guide was waiting for us with our names on a sign, easy to spot. Lissette was amazing throughout the entire private tour of the ruins. She hustled to the bus line to get us a better position and faster to the top and entrance to the site. Once inside, she was patient with us climbing to get that famous overlook view that is soon after entering. I was immediately overwhelmed and couldn't believe that after all the efforts to get there, we were actually in Machu Picchu! The site is stunning, intriguing, mysterious, scientific, fortress-like and beautiful all in one. There is so much history and significance to almost every stone, and it is much larger than it looks at first glance. Our tour guide was friendly, patient and very knowledgeable as she answered all of our questions. We never felt rushed throughout the visit and we happened to arrive at a perfect time, at the tail end of the morning entry group and before the afternoon crowds entered. Many times we had areas completely to ourselves. The entire visit was a delight and I highly recommend it with Viator. On a side note, when they speak of altitude sickness, they are not kidding. Cuzco is a beautiful city, but challenging by its thin air. We experienced headaches, shortness of breath and even insomnia! So go prepared to take it easy there. Thank goodness, Machu Picchu is actually 3000 feet LOWER and you can enjoy it easier. Johnny is the BEST tour guide we've ever had. He was extremely nice and patient. He knew all the best spots and took amazing pictures. He is very passionate about Incan history and would get so excited telling us about it, which made the whole experience that much better. Our entire group loved him and would love for him to be our tour guide everywhere we go. He made sure that we got to see every part of Machu Picchu. Also, the entire process of getting from the train to the bus to Machu Picchu and back was very smooth. Johnny had all the tickets organized and there were no issues. We were very happy with our experience from booking online, to getting an email confirmation, then a personal phone call at the hotel the night before to touch base, and the guide meeting us in the lobby of our hotel on time. She spoke English well and was friendly, knowledgeable, and pleasant to be around. She had everything organized and even offered several times to take pictures of us! :) It was very organized and we had a great time! We had a great guide who gave us a terrific tour.Disappointed with Viator. No instructions on where/when to meet guide. Calling Viator was a waste of time. Finally had to ask hotel receptionist to do so. Viator needs to do a better job with directions for when/where/what time to meet up for tours. Fatema was an amazing tour guide who had so much knowledge and interesting information about Machu Picchu. She answered every one of our questions, was an excellent storyteller who kept our kids engaged, and reminded us to respect this amazing site. We wouldn't go back and change a thing, definitely worth the money!!! Thank you!